Treat your toes to some toasty warm socks! Slip into these cozy crochet slipper socks and put your feet up—you’re going to want to show them off! The Toes-ty Slippers sock pattern is too pretty to cover up with shoes. And with their decorative star stitch cuff, these socks look great pulled up over leggings. 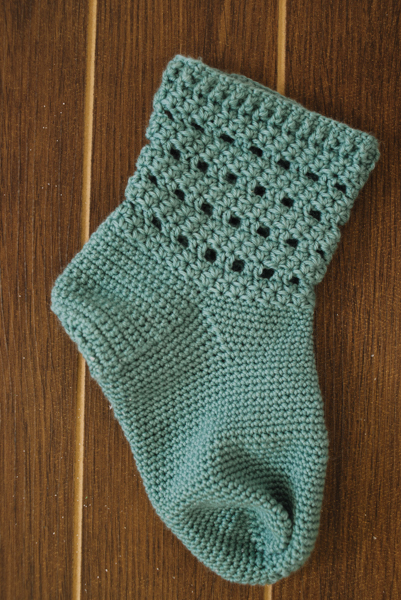 If you’ve crocheted socks before, you’ll find this pattern from I Like Crochet is a cinch to make. But if you’ve never made a pair of socks—even better! This a great pattern to start with. Worked from the cuff down, the slipper socks have a simple heel and gusset. Imagine the Toes-ty Slippers in your favorite color, keeping your feet warm as you read by the fire on a wintry day. Or, go ahead—pull on a pair of boots and take a walk through crunchy fall leaves or over the snow. These socks are worked in a fine weight yarn, so they aren’t bulky. And yet, when you get home, your feet will still feel nice and toasty. No matter what size sock you wear, the Toes-ty Slippers pattern adjusts to fit. We give you instructions for small, medium and large. To make the socks longer or shorter, just add or subtract rows as you work the pattern from the gusset to the toe. Popular designer Kristi Simpson created this pattern for I Like Crochet. Kristi excels at designing crochet socks, slippers, and accessories, and Toes-ty Slippers is no exception. Whether you’re an experienced sock crocheter looking for a unique pattern or you’ve never made a sock in your life, the Toes-ty Slippers pattern is for you. After you’ve worked this pattern once, you’ll be absolutely, well…hooked!